It contains Ammonite shell, Blue Apatite, Kunzite, Moonstone, Shungite powder, Sage, Rose Petals, Mica Flakes, 24 K gold flakes, Metal shavings, Copper coil, Black Sun Iron Oxide nano powder, Clear Quartz Crystal powder, jewelry grade epoxy resin. Comes on a velvet adjustable cord. Spiral shape of ammonite symbolizes continual change and evolution. Ammonites have absorbed cosmic energy over eons of time and help to stimulate the life force (Chi) within. Ammonites are often used for activating Kundalini and life path energies. The Ammonite shape is also often recommended to put in the home to attract health, prosperity and success. 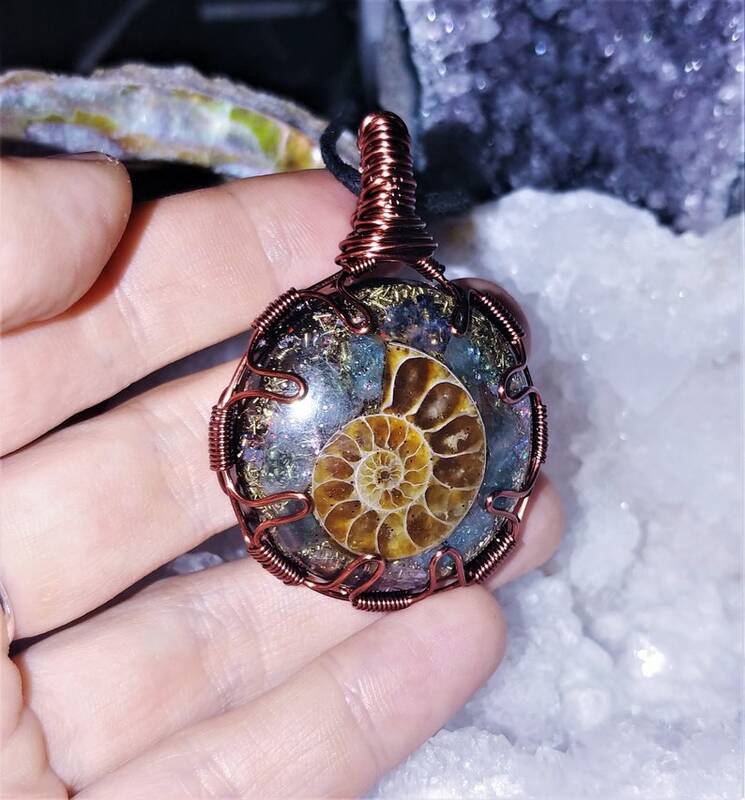 Ammonite's spiral shape draws off all negative energies. Think of the Ammonite spirals as a filter, drawing in these dense energies which are no longer needed, moving them through the spirals and releasing them as fresh, positive, loving life force energies. Beautiful piece! My first pendulum, and I wasn’t sure how it would “respond” to me. To my surprise, the response was quite immediate! She was also so kind as to include a handwritten note and small gift in addition to the pendulum, which warmed my heart so much. It’s very clear how much love and intention this seller puts into her work, and those who know, know that makes all the difference! :) I will certainly purchase from here again. Mon pendule est arrivé à temps. ce pendule me satisfait pleinement.